We’ve been journeying together up the different levels of human consciousness, step by step. From the very first awareness of being alive, the 1st chakra … when we’re aware of our breath, and the basic ways we take care of ourselves (eating, protecting from the elements, etc.). Then comes the arising awareness of our urge for creativity (both procreative and spiritual) which is the 2nd chakra energy. Next we become aware of, when we embrace our own Power, the 3rd chakra energy being utilized fully. Then, our Big Heart region expands and we feel love for all, starting with our own Self: this is 4th chakra awareness. Now comes our throat region opening, the 5th chakra and after this energy-center’s opening. we can only speak and serve that which is “Truth.” Each of us gets to explore what, exactly, our own “Truth” is. And, in LordFlea’s last post we discussed how it is when we arrive at the 6th chakra, the Third Eye. The more we allow our “Eye of God” (our 6th chakra energy-center) to open, through accepting that we are One — we become familiar with the sublime state of Oneness, also known as bliss. Or, in yogic terminology: awareness of Oneness is Satchidananda (see last post for a detailed explanation of this Sanskrit word). Some of us, mostly seekers, people who have come to accept that “something more than what we can see is going on here in life,” accept this state of Oneness when they experience it, usually in meditation. Oneness is more than a “state of mind.” Some people deny Oneness, or go through their life not believing this mind-set, expansion of perception is possible. Oneness really is a “state of being” — the sensation, or actual experiential knowledge — that everything in existence is connected energetically, through consciousness. The more a person accepts that we are ONE, tests it, revels in its glorious ubiquity, the more a person is allowing their energy field to become transparent, and … in time for some, yet for other people, one lightning-strike of awareness is all it takes to become immersed in this state of Oneness (that has no second). This spontaneous kind of awakening, of the spiritual awakening, when the veils of denial are ripped aside and Truth is revealed — is called a Kundalini awakening. It can happen at anytime during a person’s life, but always occurs, like clockwork, at adolescence. Not nurtured, the spiritual urge goes back dormant, where it lies until awakened again. Hopefully, before a person’s final moments here on Earth. Oneness, my friends, is the state of experiencing there is no separation between anything. Oneness is the condition that naturally happens when we allow our spiritual energy to arise (“spiritualizing” our lower chakras) and work its purifying magic in all the chakras, up to the 7th chakra. The more we visit the 6th chakra, the more we are likely to glimpse the magnificence of the 7th. The 7th chakra is the level of perception of totally understanding we are ONE even when we’re in our so-called “normal” everyday state of consciousness. In ot6her words, we can feel Oneness when we drive our car, shop in the grocery store, or feed our kids when we have become familiar with 6th chakra energy, and it has become a part of our “normal” consciousness. This is how the 7th chakra Oneness awareness can work in everyday life. Most people, myself included, have no desire to be in the state of All-Oneness continually. It’s too much! It’s too — too much! A continual state of immersion in Oneness simply doesn’t “fit” well with a family’s demands, most people’s work-necessities, and most of everyone’s modern, so-busy, multi-tasking responsibilities. But some people can manage to function in the “busy world” and still cultivate this state, pretty remarkable, but they do. Usually, it happens to parents after the kids have flown the nest, or after a person’s work-goals have been dealt with. My father-in-law, a successful businessman, chose to remain in the state of Oneness continually in the years before he died. He was then in his nineties. In yogic scriptures, this 7th chakra state is called Samadhi. This heightened level of perception is all-clear, all-seeing, all-knowing: it’s true understanding. Not the superficial “I know” stuff. When a person says, “I know, I know,” don’t you usually find out that person is, well, a know-it-all? That they really “think” they know, but … do they? In actuality, I’ve found in my experiences that this kind of person is so filled with their particular idea of “knowing” that they really don’t know at all. They just want you to think they do. My teacher(s) all say the same regarding spiritual awareness. Whenever I meet people who claim they have answers, the kind who make proclamations instead of asking more questions about the situation, I run in the opposite direction. The hasty remark, “I know,” we all know, only stops a conversation short. Here’s how I remember what my main teacher said about this, again paraphrasing. The more we visit the 6th chakra (by meditating, scriptural studies, keeping good company) we learn to think unbiased thoughts, without pre-judgement. This is how we become familiar with the state of “I understand” deep within us. We don’t boast of our understanding aloud, unless we’re asked. Then it’s our duty to help others who have less understanding. True understanding is a state that leads to pure contentment. Oneness consciousness has no need to boast, no need to be “the best” or “the smartest” or most “popular” or “really spiritual.” The person who happily resides in their 6th and 7th chakras, jumping back and forth from wanting “to see and know as clearly as I can” (the 6th) and “understanding” (the 7th level of awareness) have lives that are filled with contentment. The mantra “Om” (or Aum to be more Sanskrit-correct) applies to both the 6th and 7th chakras. The color of the “crown chakra” the 7th, is usually described as clear lavender, blue purple, or sparkly violet. It emanates from the crown of the head but encircles the entire body, like a flowing waterfall, refreshing, healing, protecting our body’s entire aura — reaching outward for several feet from our physical selves. I prefer to describe the color that appears in “my mind’s eye” when deep in meditation, as either complete nothingness … which is not “solid” black but motion-filled, energized, shimmering shades of pewter luminescence. In my experience, I “internally see” sparkles that bubble up from my inner Self, like the way an amethyst crystal throws off combined Clear White Light & Brilliant Lavender-y sparkles. Yes, that’s more of what it feels like to me, when I visit the state of Samadhi (which is the goal of deep meditation, by the way). The rare person who resides in their 7th chakra at all times usually has a support system around them to attend to worldly matters such as eating, paying the rent, driving the kids to school, etc. Or … they have chosen to live away from the stimulus (and demands!) of the world. There are great teachers who are blessed to be surrounded by adoring students and caretakers who do all that’s needed for them, so their energies can be devoted purely to spiritual matters. Such is the case of great spiritual teachers today, the same custom its been throughout human history’s yearning to know Spirit. In my experiences I’ve met only a few individuals who, in my humble opinion, truly live in the state of Oneness consciousness all the time. At least the times I’ve been around “enlightened” teachers. Only one teacher (out of those I’ve studied with for extended periods of time) exhibited this trait of seeing-God-in-All consistently. From what I’ve seen of the Dalai Lama, only on screens, he appears to also be in this state, which I, and many others, call “sainthood.” I appreciate these people, these great beings. I’m glad they are here to help us all; teaching us who are bungling our ways through the maya of earthly conflict and confusion. Many of us wish to be as happy as we can, here on our challenged, toxic planet Earth. But for me, I’m happy to once in a while visit this state of deep meditation, the 7th chakra, every now and then. I have no desire to reside all the time in the highest state of samadhi. I have no desire to be a teacher. I am happy being an artist who writes. By the way, in yogic tradition, when someone dies we do not say “He died.” We say, instead, “He took mahasamadhi: maha (the highest) samadhi (the state of Oneness.” Isn’t that a wonderful way of putting death? Truly, when we die our spirit returns to that state of Oneness (Spirit IT-self) from which we came when we were born. 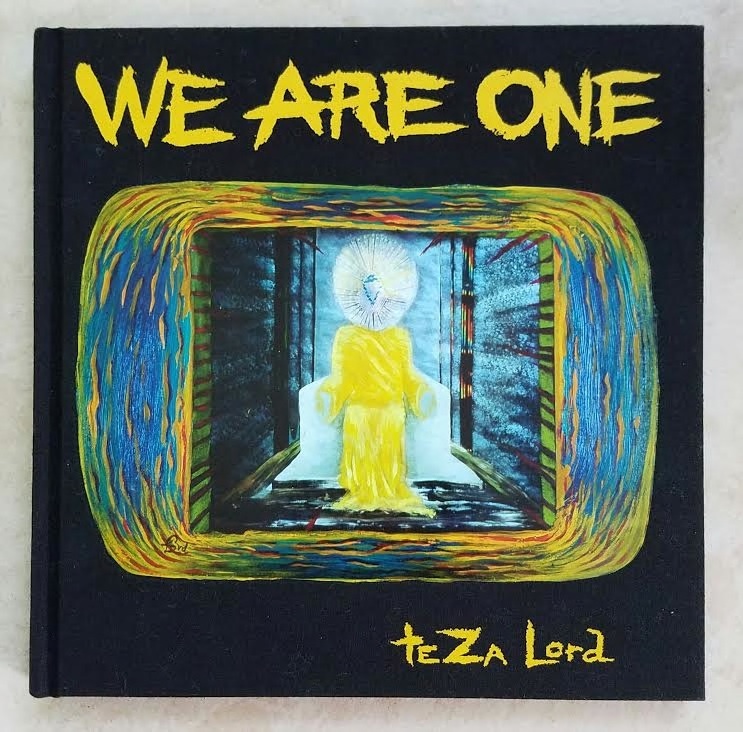 I know this from my personal experiences (We Are ONE, my book for more). Our spirits get “recycled” so to speak. When I first heard this philosophy (reincarnation in a nutshell), this is the main reason I instantly fell in love with the yogic way of life. It suits me. It makes me smile, and for me, incorporating in my Western life the concepts of Eastern mysticism, the yogic way … makes sense. I hope you’ve enjoyed our journey up from the 1st to here, the highest state of awareness, the 7th chakra. Drop me a note below and tell me how what we’ve shared these past weeks makes you feel. Or this post, today! Have you taken the time, lately, to examine your “own life” and … discovered where on the ever-upward journey of awareness, you are? If you haven’t, why don’t you take a few moment now, out of your busy day … or later, and reflect upon this question. I’d love to hear from you. Thanks for sharing your thoughts. Self-inquiry is an excellent topic … for our next post together! Hi ya Teza, I enjoy reading and gazing through your drawings and writings. My comment on this, “ahhhh I understand” post is…..insightful. Maybe you’ve read the Book of Joy? It’s a five day meeting with Dalai Lama and Desmond Tutu, both friends to each other in high places. Lama is so very humble and Tutu is so outgoing. Keep writing lordflea and I’ll keep reading it. My instinct has been to try and make this state my new baseline, moving in and out as my capacity for handling or juggling the many things requires. I find that events transpire differently when I’m there—events support the state by bringing me what would have been hard for me to do or find the resources for through usual means. I find that it’s a very efficient and convenient way to live. I couldn’t have lined things up in as perfect a way if I had tried. I’m about to relaunch my studio business post-awakening and it will be interesting to see how it goes. It’s already a much more connected business with people in ways that it wasn’t before. It’s just different. Fingers crossed. It beats punching a time clock.